NATO welcomes Turkey’s “transparency” in its ongoing Operation Olive Branch in Afrin, Syria, the alliance chief said on Monday. 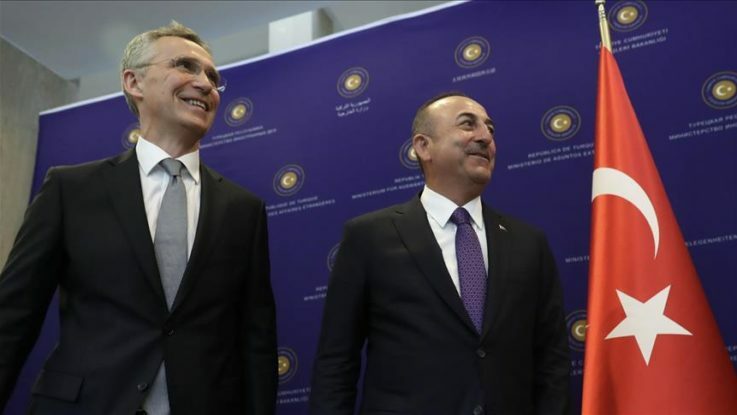 “[Foreign] Minister Cavusoglu briefed me on Operation Olive Branch, and I am grateful for Turkey’s continued transparency on this,” Jens Stoltenberg told a news conference with Turkish Foreign Minister Mevlut Cavusoglu in capital Ankara. Turkey launched Operation Olive Branch on Jan. 20 to clear the terrorist groups YPG/PKK and Daesh from Afrin, northwestern Syria amid growing threats from the region. Stoltenberg said Turkey “really” did a lot for the alliance despite facing “serious” security challenges. The NATO chief said Turkey plays a “key” role in the alliance, contributing to NATO operations and to the fight against Daesh. Cavusoglu said he and Stoltenberg discussed several regional issues, including Syria, Libya, Iraq, and a NATO summit set for July in Brussels. The Turkish foreign minister said Turkey supports NATO’s enlargement process and backs the membership processes of Georgia, Macedonia and Bosnia and Herzegovina. Stoltenberg said the two sides also discussed the “horrendous” suspected chemical weapons attack in Syria’s Douma region. “NATO strongly condemns the repeated use of chemical weapons by the Syrian regime as a threat to international peace and security. Those responsible must be held accountable,” he added. The chief reiterated there was no military solution to this conflict and NATO “fully” supports efforts led by the UN. Stoltenberg thanked Turkey for supporting the U.S.-led joint airstrike against the Assad regime. The U.S., U.K., and France early Saturday launched airstrikes on reported Assad regime chemical weapons facilities in Syria. The strikes followed the Assad regime allegedly carrying out a chemical attack in Douma, Syria which killed 78 civilians and injured hundreds of others. Cavusoglu criticized the remarks of French President Emmanuel Macron, who on Sunday said he had planned to visit Ankara to attend April 4 meeting on Syria between Turkish President Recep Tayyip Erdogan, Russia’s Vladimir Putin and Iran’s Hassan Rouhani. “Before the trilateral summit, Macron said he wanted to come to Ankara and join the summit…But, these developments were before the use of chemical weapons in Eastern Ghouta. There is no relation with these developments. He wanted to come independently of this and he did not come after he was not included in the tripartite meeting,” he said. The Turkish minister also said that despite different views, Turkey’s relations with Russia were not “weak”; Macron on Sunday said the strikes in Syria had “separated” Russians from the Turks. He also called on Greece to avoid taking steps that would escalate tensions between the two countries. He said the Greek Defense Minister Panos Kammenos likes “populism”. The minister added Ankara and Athens should continue exploratory talks to find solutions to disputes. “As NATO allies, we have to focus on a more positive agenda,” he added.